Federal Records Management & Shredding is the only AAA NAID certified company in Fort Wayne that offers secure off-site and on-site document shredding as well as document management & storage. Did you know that the average American family throws out 176 pounds of e-waste every year? That’s equal to about 400 iPhones. Examples of e-waste include smartphones, tablets, printers, and computers. Businesses have even more e-waste to dispose of each year. After all, they have more monitors, printers, and hard drives than the average family. These items can quickly become outdated and when a device reaches the end of its lifespan, it’s time to replace it. But what do you do with items when you know longer need them? These five tips will help you manage e-waste disposal for your company. The first thing to do is check in with your local waste disposal programs. Your local government may have programs in place to manage e-garbage with little trouble. Other local businesses may also have programs for the recycling of e-waste. As a business, you may have more e-waste than they expect. Talk to them, and make arrangements to handle the amount of e-waste your business produces. Another way to deal with electronic devices that are no longer needed in your business is to donate them. Provided the items are in good working order, they can be redistributed. Another thing your business can do is resell used devices you no longer need. As long as it’s in good working order, you shouldn’t have a problem selling an iPhone or a computer on eBay or Craig’s List. You may even be able to sell devices that don’t work any longer. Some purchasers salvage parts from these devices to fix other devices. One of the causes of e-waste is a lack of planning. Purchasing equipment such as a computer is a business decision you plan and cost carefully. You should also make sure you plan for the end of the item’s life, including how it will be disposed of. You may not think of smaller items, such as portable hard drives or other electronic gadgets. Many of these items are handed out at conferences, so you may not think twice about trashing them. If you attend a conference with these gifts, ask if there’s a program for recycling them. If you don’t need one, don’t take one. If you’re planning the conference, be sure to think ahead about disposal before you opt for these gifts. The best way to reduce electronic garbage is to buy less in the first place. There will be times when you can’t avoid needing to dispose of your e-waste. When that happens, always be sure to check the credentials of the recycler you choose. Working with a certified recycling company means you can trust your e-waste is disposed of properly. You have many options for e-waste disposal. Keep in mind that disposal isn’t always the right answer for your electronic devices. Keeping your data safe should be one of your top priorities. In some cases, you’ll need to use other measures when you have devices that have reached the end of their lifespan such as destroy the hard drives to protect confidential information. Our blog has many more tips for keeping all your business data safe. 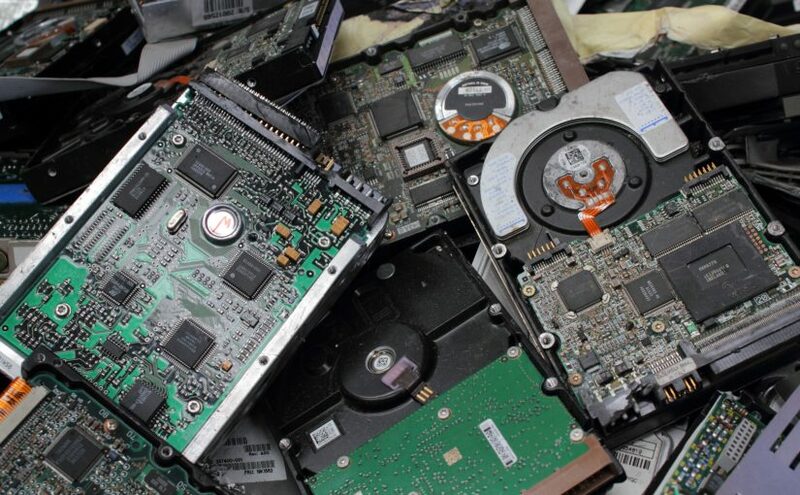 Read up on how to destroy a hard drive or the benefits of paper shredding to protect your data.